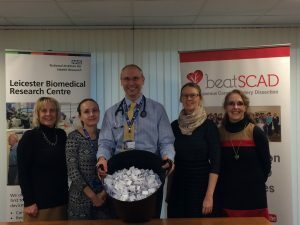 The Beat SCAD Prize Draw took place on Tuesday 28th November at the Leicester Biomedical Research Centre, the home of the UK SCAD research project. Lead researcher Dr David Adlam and research fellow Dr Alice Wood drew the winning tickets in the presence of Trustees Rebecca Breslin and Karen Rockell and volunteer Jacqui Hughes. The Beat SCAD team would like to extend a huge thank you to everybody who supported this event and bought or sold tickets. It was fantastic to see many members of the SCAD community joining in. Tickets were sold all over the country, from Somerset in the Southwest of England to Caithness in the far North of Scotland. Thanks also to everyone who donated the fantastic prizes and to Drs Adlam and Wood for drawing the winning tickets. The £3000 will be used to help fund an important part of the genetics study: to purchase and distribute blood sample tubes to research registrants who have not yet attended an appointment in Leicester.